The colosseum was carved in the rock northwest of the ancient Arindal, which is located north of town center. It opens only on special times and is a popular place to check, if you can solo a certain monster and bet on the fighters. You can fight against a large variety of monsters, Zöo (?) can tell you, which ones are available. To fight, you have to talk to Roster near the entrance. You have to pay him 5 coins and tell him, how many (maximum is 3) of which monster you want to fight against. The audience may bet on each fight, which can be done by simply saying "<amount> on exile" or "<amount> on beast". Beast Bookie and Exile Bookie yell the winning rates every few moments. 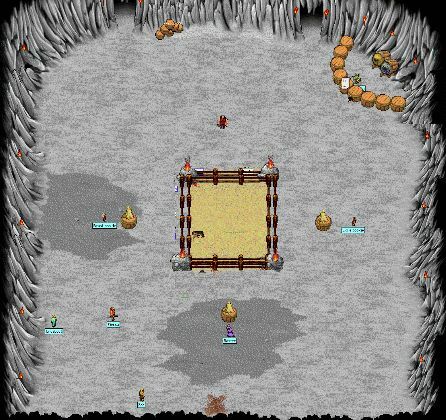 If you die in the arena, you will be teleported to the room in the northwestern corner, which is mostly filled with mice who wait for the bodies of unsuccessful gladiators. This page was last modified on 15 October 2007, at 11:19.